The Soninke (also called Sarakole, Seraculeh, or Serahuli) are a West African ethnic group found in eastern Senegal and its capital Dakar, northwestern Mali and Foute Djalon in Guinea, and southern Mauritania. They speak the Soninke language, also called Maraka language, which is one of the Mande languages. Soninke people were the founders of the ancient empire of Ghana c. 750-1240 CE. Subgroups of Soninke include the Maraka and Wangara. When the Ghana empire destroyed, the resulting diaspora brought Soninkes to Mali, Senegal, Mauritania, Gambia, Burkina Faso, Ghana, and Guinea-Bissau where some of this trading diaspora was called Wangara. Predominantly Muslims, the Soninke were one of the early ethnic groups from sub-Saharan West Africa to convert to Islam in about the 10th century. The contemporary population of Soninke people is estimated to be over 2 million. The cultural practices of Soninke people are similar to the Mandé peoples, and those of the Imraguen of Mauritania. It includes traditional Islamic rites of marriage(s), circumcision and social stratification. Archaeological evidence suggests that the regions where Soninke people are found were inhabited in ancient times. These stone settlements were built on the rocky promontories of Tichit-Walata and the Tagant cliffs of Southern Mauritania. However, there are no surviving records to suggest which ethnic group these people were, but the settlers of this region by between 1000 BCE and 600 BCE were likely related to the Soninke people. A significant agro-pastoral society had developed in this prehistoric era. According to Soninke oral tradition, the ancestor of the Soninke was Dinga, who came from the Middle East. His sons included Dyabe Sisse, the founder of the Wagadu kingdom with its capital at Kumbi. Another Soninke tradition indicates that they migrated from Aswan, Egypt. The early written records about Soninke come from early Islamic historians. The Soninke, according to these records, were the founders of the ancient Ghana Empire (not to be confused with modern Ghana), also called the Wagadu Empire. This empire has roots in the 5th century CE and was destroyed by about the 12th century, after the Muslim invasions of this region started in the 10th century. In contemporary time, the total population of Soninke people is above 2 million. Soninke people are found throughout West Africa and in France, given their migration when Senegal and Mali were a part of the French colonial empire. Most of the Soninke people are found in the valley of the upper Senegal river and along the Mali–Senegal–Mauritania border between Nara and Nioro du Sahel. Migrations under French colonial rule led many Soninke to build communities in Dakar, other cities in Africa and in France. 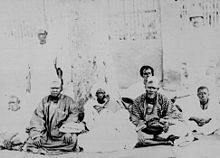 Soninke community were the early settlers in France, their community is found in Paris and in southern French cities, and their language is the primary dialect spoken among many Muslim communities of France. There are also many Soninke living in cities throughout Central Africa, a population that includes new migrants as well as descendants of migration dating back to the 1800s, such as the laptots who represented French mercantile and colonial interests in the region. Trade networks led by the Wangara mercantile confederations, spread Soninke people and culture throughout most of Mali and Senegal, southern Mauritania, northern Burkina Faso, as well as parts of the Gambia, and Guinea-Bissau. The Maraka-Soninke merchant communities and plantations (centered just north of the city of Segou, Mali) were an economic mainspring under the Bambara Empire, and built trade routes in the West Africa region. The Soninke people were a coastal trade link between the Berber people of Maghreb and the Empires in sub-Saharan West Africa. In their early history, they helped exchange salt from the north and western coast for gold found inland. This trade brought Muslim traders to them, particularly Arab traders interested in gold, after Islam arrived in North Africa. The earliest passing mention of Soninke people's Ghana Empire is found in the works of the 8th century Arab geographer Muḥammad ibn Ibrāhīm al-Fazārī and a more complete record is found in works of another 11th century Arab geographer Al-Bakri. The rulers and Soninke people of the Ghana Empire converted to Islam in the 11th century, and they have been Muslim ever since. Some Islamic sources suggest that the conversion was triggered after the 1076 Almoravid conquest of the Ghana Empire. The Soninke people, like other Mande peoples, subscribe to the Maliki school of Sunni Islam. The Soninke society and its culture has historically many cultural practices with its neighboring ethnic groups, particularly the Mande peoples. This includes the religion of Islam, occupations, foods, the rites of passage, family structure, weddings and social stratification. Soninke society, like other groups in Mande and beyond, is shaped by various forms of social stratification. The Soninke strata have included a free category called Horro or Horon, a caste system category called Namaxala or Nyaxamalo, and slaves called Komo. In the Jaara subgroup of the Soninke people, the nobility called Tunkanlenmu was another strata. Soninke society became highly stratified after the 13th century. The slaves were the largest strata, one at the bottom among the Soninke like other West African ethnic groups, and constituted up to half of the population. The slaves among the Soninke people were hierarchically arranged into three strata. The village slaves were a privileged servile group who lived apart from the village and took orders from the village chief. The domestic slaves lived with a family and could not be sold. The lowest level among slaves were the trade slaves who could be bought and sold. With time, each of these strata became endogamous, states Daniel Littlefield, a professor of history. Above the slaves were the castes of Soninke, which too were hereditary, endogamous and had an embedded hierarchical status. They included, for example, the garanke (leather workers) below the fune (bard), the fune below the gesere or jeli (griots, singers), the jeli below the tage or numu (smiths, pottery workers). The castes and slaves system of Soninke may be linked. According to Susan McIntosh, a professor of anthropology specializing in African societies, archeological evidence shows that Arabs and Berbers had expanded and established an integrated sub-Saharan trade and transport network with West Africa, building upon the pre-existing trade routes through western Sudan. This trade, by the 9-10th centuries, states McIntosh, included commodities and slaves. The reach of slave trading had extended into Ghana and the western Atlantic coast by the 11th century, and slave raiding, capture, holding and trading systems became increasingly sophisticated in 13th and 14th century Mali Empire and 16th century Songhai Empire. As the practice of slavery grew, so did the caste system. Tamari suggests that a corollary of the rising slavery system was the development and growth of the caste system among numerous ethnic groups of Africa by about the 13th century. McIntosh concurs with Tamari, but states that the emergence of caste systems likely occurred much earlier in West African societies such as Soninke, Mande, Malinke, Wolof, Serer, and others. She places the development and spread of castes in these societies to about the 10th century, because the slave capture, slave trade and slave holding by elite families was an established institution in West Africa by then, and slavery created a template for servile relationships and social stratification of human beings. The linguistic evidence suggests that stratification structure relating to caste system and slavery likely were shared between the Manding and Soninke people, and possibly some others such as the Dogon people of West Africa. However, the linguistic differences between the caste and slave systems between Soninke and northern ethnic groups of Africa such as the Tuareg people and Moors suggests that these evolved separately. Marriage in Soninke society followed Islamic practices. Cousin marriages are common and preferred in Soninke culture, just as with the Fula people. Parents consent to marriage. A traditional proverb states, "Cousins are made for each other." The practice among Soninke merchants, states Saskia Brand, a professor of psychology and educational sciences, may be related to the cultural belief that cousin marriages "helps to keep the money in the family". If both families agree, the couple is engaged (i na tamma laga) in a mosque. Each month after the engagement, the man pays the woman's family a bridewealth dower (nakhafa) for their food and other spending. The marriage, called futtu, is complete with a marriage contract that mentions the dower, and is accompanied with a wedding event called karikompe. The newly married couple has advisors. The man’s advisor is called the “khoussoumanta-yougo” and the woman’s is called “khoussoumanta-yakhare”. After one week of celebration, the women meet to show the gifts that the couple received from their parents mostly from the woman's mother. Marriage across social strata and caste lines has been taboo, states Saskia Brand. But, in polygynous noble families, a noble could take a wife from the slave strata. The Soninke people have long carried out female genital mutilation (FGM), also called female circumcision. The prevalence rate of FGM is higher among the Soninke than among neighbouring ethnic groups such as Wolof people and others,. The practice is culturally done as a ritual of social acceptance, and sometimes assumed to be required for religious reasons. In Mauritania and Senegal, FGM of a child is illegal in contemporary law but continues because it is culturally sanctioned for young girls as young as one year old. According to the 2009 Report on Human Rights Practices by the US State Department, FGM practice among Soninke has included the most dangerous Type III mutilations. Breakfast foods include fonde, porridge made of millet, sugar, milk, and salt, and sombi porridge made of rice, millet or corn. For lunch demba tere and takhaya are very common, both containing rice and peanuts, frequent Soninke ingredients. Dere, a stew, is a mixture of millet and beans. The Soninke traditionally engage in both trade and agriculture. During the rainy season, men and women both cultivate. However, women usually stay at home to cook and take care of their children. They also do other work, such as dyeing cotton material. Many early West African immigrants in France came from this ethnic group. The Soninke are an influential ethnic group in the Gambia, Senegal and Mali. ^ a b c Diagram Group (2013). Encyclopedia of African Peoples. Routledge. p. 825. ISBN 978-1-135-96341-5. ^ Ralph A. Austen (1999). In Search of Sunjata: The Mande Oral Epic as History, Literature and Performance. Indiana University Press. p. 143. ISBN 0-253-33452-7. ^ a b c Andrew Dalby (1998). Dictionary of Languages: The Definitive Reference to More Than 400 Languages. Columbia University Press. p. 574. ISBN 978-0-231-11568-1. ^ John O. Hunwick (2003). Timbuktu and the Songhay Empire: Al-Saʿdi's Taʾrīkh Al-Sūdān Down to 1613. BRILL Academic. pp. xxviii with footnote 18. ISBN 90-04-12822-0. ^ a b Asante, Molefi Kete. The History of Africa: The Quest for Eternal Harmony. New York: Routledge, 2007. 121-2. ^ a b c d e Saskia Brand (2001). Mediating Means and Fate: A Socio-Political Analysis of Fertility and Demographic Change in Bamako, Mali. BRILL Academic. pp. 69–71. ISBN 90-04-12033-5. ^ a b c d e Ouldzeidoune, Nacerdine; Keating, Joseph; Bertrand, Jane; Rice, Janet (2013). "A Description of Female Genital Mutilation and Force-Feeding Practices in Mauritania: Implications for the Protection of Child Rights and Health". PLOS One. 8 (4): e60594. doi:10.1371/journal.pone.0060594. PMC 3621896. ^ a b Michael Gomez (2002). Pragmatism in the Age of Jihad: The Precolonial State of Bundu. Cambridge University Press. p. 24. ISBN 978-0-521-52847-4. ^ a b c David C. Conrad (2009). Empires of Medieval West Africa: Ghana, Mali, and Songhay. Infobase. pp. 23–25. ISBN 978-1-60413-164-2. ^ a b Kevin Shillington (2012). History of Africa. Palgrave Macmillan. pp. 88–89. ISBN 978-1-137-00333-1. ^ David C. Conrad (2009). Empires of Medieval West Africa: Ghana, Mali, and Songhay. Infobase. p. 25. ISBN 978-1-60413-164-2. , Quote: "The legend often begins by describing how the ancestor Dinga came from somewhere in the Middle East." ^ Levtzion, Nehemia (1973). Ancient Ghana and Mali. New York: Methuen & Co Ltd. pp. 16–18, 21. ISBN 0841904316. ^ Alexander, Leslie M.; Jr, Walter C. Rucker (9 February 2010). "Encyclopedia of African American History [3 volumes]". ABC-CLIO. Retrieved 25 April 2018 – via Google Books. ^ Soninke people Archived 2016-11-05 at the Wayback Machine, Encyclopædia Britannica, Quote: "The Soninke were the founders of the ancient empire of Ghana, which was destroyed after the invasions of Muslim conquerors in the 10th century". ^ François Manchuelle (1997). Willing Migrants: Soninke Labor Diasporas, 1848-1960. Ohio University Press. Archived from the original on 2017-10-02. ^ a b Kevin Shillington (2012). History of Africa. Palgrave Macmillan. pp. 90–92. ISBN 978-1-137-00333-1. ^ John A. Shoup (2011). Ethnic Groups of Africa and the Middle East: An Encyclopedia. ABC-CLIO. pp. 183–184. ISBN 978-1-59884-362-0. ^ Haddy Tunkara-Bah (2016). "Sociocultural factors influencing fertility among the Soninke". African Renaissance. 13 (1–2): 31–44. , Quote: "The Soninke society in the Gambia is primarily rural and highly gender-stratified culture. (...) In the Soninke social organization everyone occupies a place." ^ Tal Tamari (1991). "The Development of Caste Systems in West Africa". The Journal of African History. Cambridge University Press. 32 (2): 221–250. doi:10.1017/s0021853700025718. JSTOR 182616. ^ a b Tal Tamari (1995). David C. Conrad and Barbara E. Frank (ed.). Status and Identity in West Africa: Nyamakalaw of Mande. Indiana University Press. pp. 61–63. ISBN 0-253-11264-8. ^ a b Sean Hanretta (2009). Islam and Social Change in French West Africa: History of an Emancipatory Community. Cambridge University Press. pp. 37 with footnote 23. ISBN 978-0-521-89971-0. ^ a b Daniel C. Littlefield (1991). Rice and Slaves. University of Illinois Press. pp. 79 footnote 11. ISBN 978-0-252-06214-8. ^ a b Barbara G. Hoffman (2001). Griots at War: Conflict, Conciliation, and Caste in Mande. Indiana University Press. pp. 8, 10–12, 30–31, 35–36, 235–240, 246, 269–270 note 31. ISBN 0-253-10893-4. ^ a b c d e Susan McIntosh (2001). Christopher R. DeCorse (ed.). West Africa During the Atlantic Slave Trade: Archaeological Perspectives. Bloomsbury Academic. pp. 17–18. ISBN 978-0-7185-0247-8. ^ Tal Tamari (1995). David C. Conrad and Barbara E. Frank (ed.). Status and Identity in West Africa: Nyamakalaw of Mande. Indiana University Press. pp. 65–67, 71–73. ISBN 0-253-11264-8. ^ Tal Tamari (1995). David C. Conrad and Barbara E. Frank (ed.). Status and Identity in West Africa: Nyamakalaw of Mande. Indiana University Press. pp. 68–69. ISBN 0-253-11264-8. ^ "Culture Et Tradition". Soninkara.com. 2002. Archived from the original on 2006-01-13. Retrieved 2006-04-05. ^ "The circumcision among Soninke". Soninkara.com. Archived from the original on 2006-12-25. Retrieved 2006-04-28. ^ Ericksen, K. P. (1989). "Female Genital Mutilations in Africa". Cross-Cultural Research. 23 (1–4): 182–204. doi:10.1177/106939718902300104. ^ US State Department (2010). Country Reports on Human Rights Practices 2009. Government Printing Office. p. 554. ^ "Soninke Recipes". Soninkara.com. 2002. Archived from the original on 2007-02-20. Retrieved 2006-04-05. ^ Meadows, R. Darrell (1999). "Willing Migrants: Soninke Labor Diasporas, 1848-1960". Journal of Social History. Retrieved 2006-04-28. (in French) Louis Léon César Faidherbe, Vocabulaire d'environ 1,500 mots français avec leurs correspondents en ouolof de Saint-Louis, en poular (toucouleur) du Fouta, en soninké (sarakhollé) de Bakel, 1864, Saint-Louis, Imprimerie du Gouvernement, 1864, 70 p.
(in French) Louis Léon César Faidherbe, Langues sénégalaises : wolof, arabe-hassania, soninké, sérère, notions grammaticales, vocabulaires et phrases, E. Leroux, 1887, 267 p.
(in French) Direction de la promotion des langues nationales du Sénégal, Livret d'auto-formation en Soninké, éditions Kalaama-Edicef, 2001. Wikimedia Commons has media related to Soninke. This page was last edited on 1 April 2019, at 12:19 (UTC).